Republican congressional leaders are like a football coach who believes the secret to winning is to punt early and often. House Speaker Paul Ryan and others are claiming victory over the 2,000-plus page appropriations bill, but this is a “no boondoggle left behind” $1.1 trillion nightmare. The bill fails to block perhaps the Environmental Protection Agency’s greatest land grab — its “waters of the United States” decree that seizes federal jurisdiction over 20 million acres that are sometimes wet. The EPA’s wetland crackdowns have been trounced by numerous judges. Republicans faltered even though the Government Accountability Office reported Monday that EPA had engaged in illegal “covert propaganda” to promote this policy. The bill extends the earned income tax credit without reforming it — though the IRS estimates that up to 25% of all handouts under the law are fraudulent or otherwise improper. The bill provides almost $27 billion for public housing and Section 8. That includes an almost half a billion dollar increase for subsidized rental vouchers, despite the long record of havoc in neighborhoods where recipients cluster. The omnibus bill also dropped provisions to curb the Department of Housing and Urban Development from bankrolling fair housing entrapment-like operations or enforcing new regulations to bludgeon localities with a lower percentage of minorities than the national averages. Some provisions of the bill seem harebrained even by Beltway standards. Republicans were justifiably outraged by the Bureau of Alcohol, Tobacco, Firearms and Explosives’ “fast and furious” operation, which authorized sending more than a thousand guns to Mexican drug cartels. Section 276 of the omnibus bill prohibits federal agents from providing guns to anyone he “knows or suspects … is an agent of a drug cartel, unless law enforcement personnel of the United States continuously monitor or control the firearm at all times.” So the G-man is supposed to keep his finger on the suspect’s trigger at all times, or what? Perhaps it would be too easy to cease giving weapons to drug dealers. 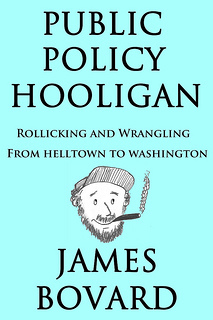 While Congress made scant effort to protect average Americans from rampaging regulators, it hustled to include a provision requesting the Capitol Police to permit sledding on Capitol Hill. The “sled free or die” provision was a “bipartisan win,” according to The Washington Post. It is regrettable that there was little or no bipartisan interest in curbing federal power beyond spitting distance from the Capitol Dome. House Freedom Caucus member Tim Huelskamp, R-Kan., summarized the GOP leadership’s wacky reasoning: “Give the Democrats what they want now so next time they won’t want as much.” Republicans have been thunderously promising for decades to protect Americans against federal waste, fraud and abuse. At this rate, Republicans’ credibility gap will soon rival the $18 trillion federal debt. That’s only not a victory if you presume that (R)s are any different than (D)s when it comes to getting money out the door to donors or power in the door for themselves. Lawhobbit, you have clearly not been listening to the speeches from both sides. Their leaders are emphatic that they are different. If I’m going to kill brain cells, it’ll be quickly and cleanly with alcohol. I respect my mind too much to torture them to death with drivel. 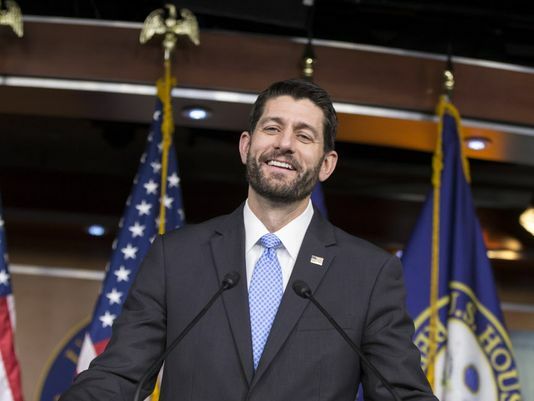 Maybe it’s just me, but Paul Ryan seems to be working the Mahmoud Ahmadinejad look. I think there is a Homeland Security bulletin out that says growing a beard is the first sign of radicalization. Is Ryan a secret Muslim plotting with ISIS to bring down the government using appropriations as a WMD? Holy Jihad! Grab your wallet and head for the hills! Dang! I hadn’t heard about that Homeland Security bulletin. No wonder TSA doesn’t like me. Ya, those appropriation bills have wreaked havoc on the economy – for decades.